A rare and beautiful case format map of Italy and Switzerland from 1859. Produced by London cartographer Charles Smith. Covers from Geneva in the west as far east as Turkey and Dalmatia, north to Vienna, and south to include Sicily. Also includes Sardinia and Corsica. 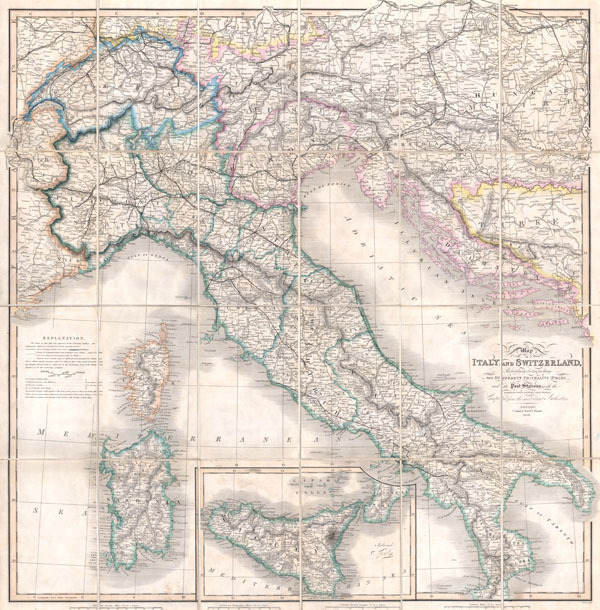 This map was originally issued by Smith in 1818 as a 'New Post Map of Italy and Switzerland.' Smith intended the map for 19th century English travelers to Italy and so gives particular attention to distances, roads, and the quality of those roads. Offers basic but attractive topographic details. Sicily is depicted as an inset map at the bottom center. Dissected and mounted on linen in 24 sheets. Folds into its original cardboard binder. Fine or perfect condition. Dissected and mounted on linen in 24 sheets. Original linen in fine condition. Folds into its original cardboard case. Case in good condition with some minor wear on the edges and title area. Shapero, The Folding World (January, 2003), item 178.